Product prices and availability are accurate as of 2019-04-15 03:01:29 UTC and are subject to change. Any price and availability information displayed on http://www.amazon.co.uk/ at the time of purchase will apply to the purchase of this product. We are proud to present the brilliant CASEMATIX DRONESAFE Rugged Mini Drone Carry Case Organizer With Customizable Foam - Protect DJI Mavic Pro Foldable Drone Combo and Accessories Such as Remote Control , Extra Batteries , Propellers. With so many available today, it is good to have a make you can recognise. 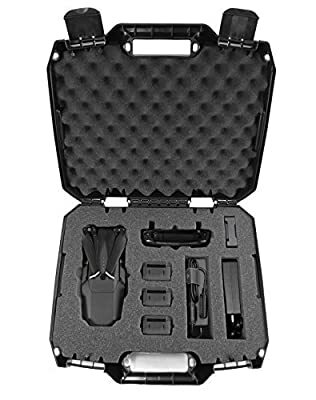 The CASEMATIX DRONESAFE Rugged Mini Drone Carry Case Organizer With Customizable Foam - Protect DJI Mavic Pro Foldable Drone Combo and Accessories Such as Remote Control , Extra Batteries , Propellers is certainly that and will be a superb great bargain buy. 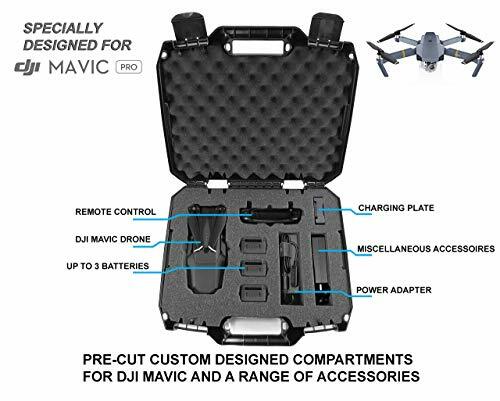 For this price, the CASEMATIX DRONESAFE Rugged Mini Drone Carry Case Organizer With Customizable Foam - Protect DJI Mavic Pro Foldable Drone Combo and Accessories Such as Remote Control , Extra Batteries , Propellers is highly respected and is always a regular choice amongst most people. CASEMATIX have provided some nice touches and this results in good value for money. This hard shell case's exterior is made of a dense, injection composite plastic for superior external protection against blunt forces, drops, dings and other unforeseen mishaps that can damage your valuable drone and accessories. Interior protection consists of a Tri-Layer arrangement with one Convoluted Egg-Crate Top Foam Layer measuring 1.00", a dense shock absorbing foam Middle Layer measuring 3.00" thick and a .75" foam bottom layer. 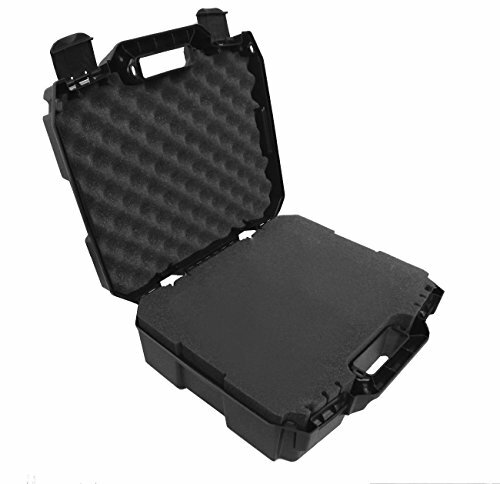 With the combination of a highly durable exterior and padded foam interior, you can be sure your drone equipment has reliable storage and protection. The locking mechanism accommodates a padlock under the carrying handle for keeping your devices secure. 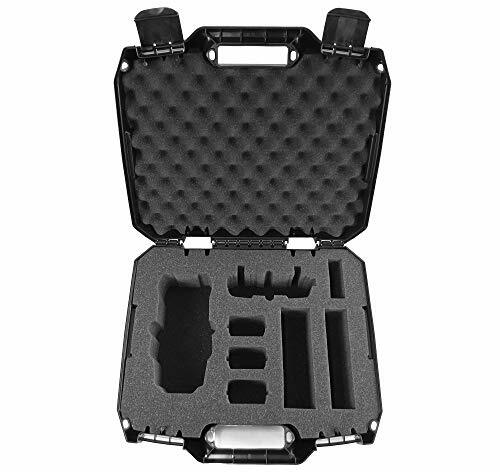 This hard case is perfect for the DJI Mavic and is easy to transport using its convenient carrying handle. Measuring 16.0" x 13.0" x 6.0" in exterior dimensions, this case is the ideal solution for securing and protecting your DJI Mavic and equipment while traveling. Keep all your drone accessories organized and in one place. 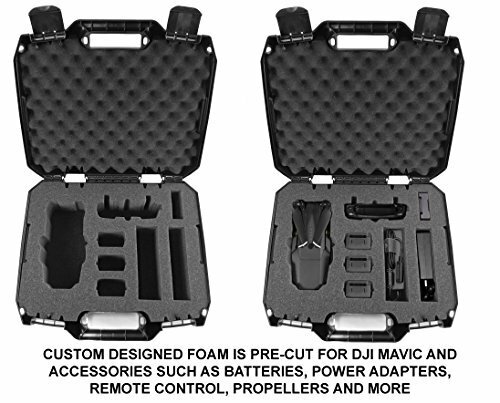 The dense foam middle layer of this case has 8 compartments designed to hold the DJI Mavic Drone, three batteries, flight controller, battery charging base and an additional area for propellers and other accessories. The compartments are precision cut to snugly hold the drone in place and provides padded foam impact protection from all angles. The compartments firmly hold everything in place and prevent movement and vibration when traveling.